Russell Finex has introduced a new and improved Russell Compact Self-Loading Sieve™, a complete stand-alone, fully enclosed system which conveys, screens and discharges your material in one easy operation. In many factories there is often a need to mix powders or granules during the manufacturing process, which is commonly carried out manually with an operator debagging materials. Therefore, to satisfy HACCP and to avoid contamination entering the final product, a sieving process is usually introduced. The new Russell Compact Self-Loading Sieve™ is the ideal machine for this installation and is capable of fully automated and enclosed screening and conveying of powders or granules up to 5 meters with minimal operator involvement. This eliminates the need for additional feeders, conveyors and discharge systems. Incorporated in this revolutionary system is the world renowned Russell Compact Sieve®, a high capacity vibratory sieve ideal for safety screening powders and granules. This vibratory sieve has minimal contact parts and uses quick release clamps which allow operators to quickly strip down the machine without the need for tools. With an all in-one system, the Russell Compact Self-Loading Sieve™ eliminates product handling and product wastage caused by material being held up in feeders and hoppers, preventing damage to the product and protecting the operators’ health and safety. Furthermore, installation and operator costs are reduced as additional feeders, conveyors and discharge systems are not required. The self-loading sieve works by drawing material into the screener via a vacuum, which is created by an electric pump (exhauster). The air is separated from the material via a filter integrally mounted in the lid of the sieve. An integrated control system, which provides three fully adjustable pre-sets to change loading and screening requirements, switches off the vacuum and the material is sieved and discharged into the next part of the process, and the cycle is ready to begin again. With material passing through the sieve in a straight line, there are no hold ups or dead points, which allow maximum separation on the screen before the product is discharged. 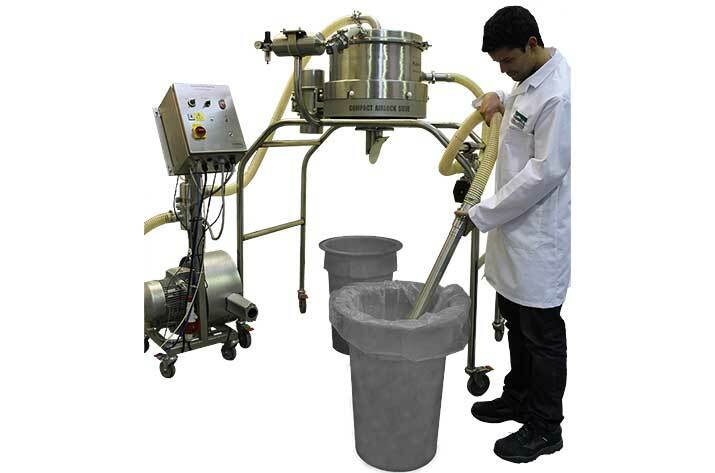 The Russell Compact Self-Loading Sieve™ is ideal for screening powders or granules but is particularly suited to the food, pharmaceutical and chemical industries. In the food industry, the system can be installed above a mixer to screen food ingredients such as flours, sugars and flavourings to ensure final product quality is not compromised. Also since it is a fully enclosed system this makes the system particularly suitable to the pharmaceutical and chemical industries where operators must be safeguarded from harmful dusts and fumes. For more information visit the Russell Compact Self-Loading Sieve pneumatic screener page or contact us.